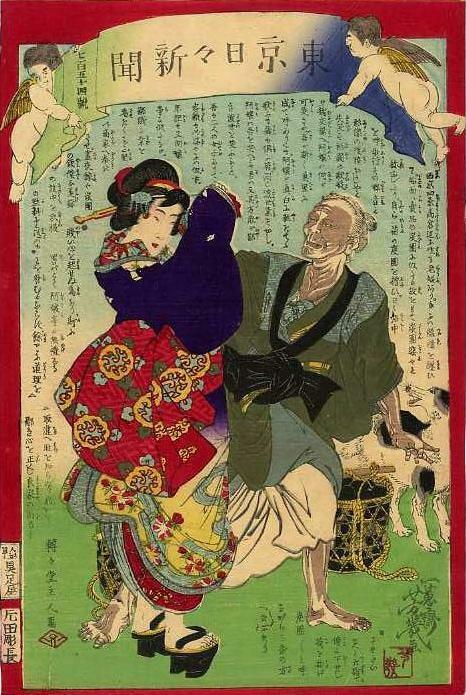 In the prints shown here, the coloration of the older woman's skin varies from a grayish brown (left) to pink (middle) to dark brown (right). Most prints in circulation appear more like the print in the middle. A few run from rusty to charcoal gray. The first grayish prints I saw reminded me of the oxidation seen in the flesh tones of a certain Osaka news nishikie (Nichinichi shinbun No. 18). But on the Osaka print, even the flesh of the cherubs has darkened. 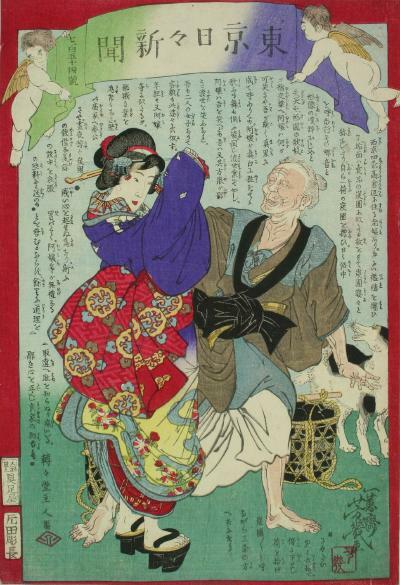 In the TNS print shown here, the flesh of the younger woman and the cherubs remains light -- while the color of the older woman's skin is shared by the snout and tongue of the dog and the grip of the charcoal basket. The younger woman is a Gion geiko, pampered by baths and white powder. The older woman is a charcoal peddler, impoverished and ever dirty from her work. The contrast of their skin tones is clearly intentional. The problem is -- were the pigments used for the older woman's skin dark when applied? Or were they intended to darken with age and exposure? There is an old lady who lives around Takakura on Shijo in Saikyo [in Kyoto]. She wraps her body in rags. As her dirty face looks like the charcoal she peddles [people] call [her] charcoal hag. She carries a load of charcoal. The accent and appearance [of her] calling and walking through the capital daily. [Someone] laughs Oh, how funny. [She] grabs the lapel of a Gion geiko. What are you laughing at? I, becoming very black like this, call and walk. You, painted very white, sing and dance, together all. Are the same work of crossing this world. Though you laugh at me there I do not laugh at the vulgar occupations of your kind. I have two daughters and their features don't look like this hag. In time they will look like you all. She lifted the load she had lowered beside her and went toward Sanjo calling Charcoal, charcoal. What are you laughing at? reflects 阿嬢ハ何が可笑きや (Onmi ha nani ga okashiki ya). 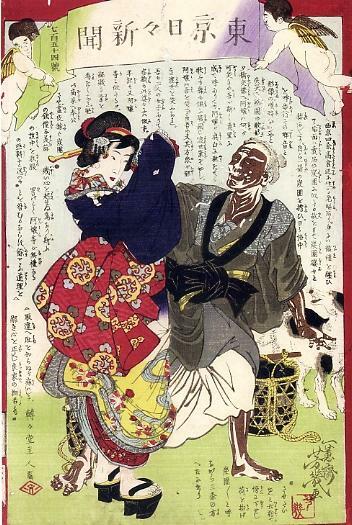 For another story featuring a woman whose complexion is dark because of her connection with charcoal, see TNS-923 Benzo kills Nanigashi.